An injury can change your life. It can mean overwhelming medical bills and an uncertain future for you and your family. If the injury was caused by someone else, we don’t believe you should pay for it. 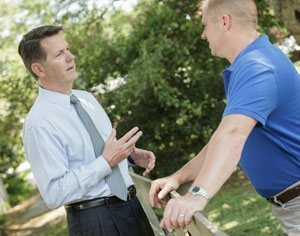 GibsonSingleton Virginia Injury Attorneys serves our community, and we care about our neighbors. We share safety information to help prevent accidents. But, when a serious accident does happen, we consider it a calling to help those who are hurt. If you or a loved one has been injured, we want to help you recover your losses and make sure that your future expenses are paid for too. As former members of the United States Marine Corps, Ken Gibson and John Singleton have served their country, and now they’re ready to serve you. They will not hesitate to go to trial and fight aggressively for your best interests. We, the team at GibsonSingleton Virginia Injury Attorneys, will put our 60 years of combined legal experience and winning track record behind your case to get you the compensation you deserve. We’ll deal with the insurance companies. We’ll stand up for you. “They are my friends for life! “What a blessing they are! We will pursue your claim to the fullest extent of the law. We’ve worked for big insurance companies and in big cities. We know what to expect from the other side, and we are not intimidated. Today, we live and work here on the Middle Peninsula, and we stand ready to help our neighbors. Yes, compensation is available, but not easy to get. The responsible person’s insurance company will fight you every step of the way. That’s why you need experienced and determined lawyers. Loss of love, affection, companionship, guidance, etc. Loss of household services the deceased provided, such as bookkeeping, child care, vehicle and property maintenance, etc.